Heat oil in Dutch oven or large saucepan over medium-high heat until hot. With wire whisk, stir in flour; cook about 5 minutes or until mixture turns medium brown, stirring constantly. Stir in onions, celery and bell pepper; cook about 4 to 5 minutes or until softened, stirring frequently. Add garlic; cook and stir 30 to 60 seconds or until softened. Add tomatoes, broth, okra and Cajun seasoning; mix well. Bring to a boil. Reduce heat to low; partially cover and cook 25 to 30 minutes to blend flavors, stirring occasionally. Add shrimp; cook an additional 5 minutes or until shrimp turn pink. If desired, serve with hot cooked rice. Gumbo is one of the stars of Creole cuisine. 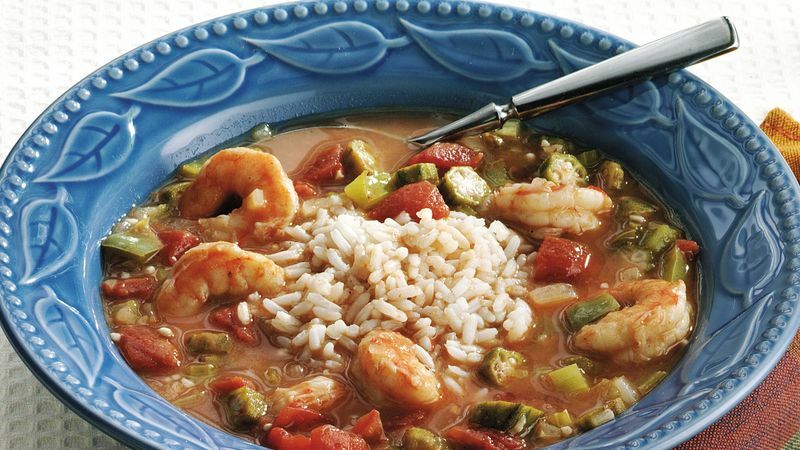 Classic gumbo reflects key Creole ingredients and preparation methods. It starts with a brown roux, or cooked fat-flour mixture, and it is seasoned with diced onions, celery and green bell pepper. Creole chefs call this combination of aromatic vegetables the holy trinity. Okra flavors and thickens many gumbo recipes. Fresh or frozen okra works equally well in this recipe. To keep the oil and flour mixture from burning, use your heaviest Dutch oven or saucepan and whisk constantly while browning the roux. To make Chicken Gumbo, omit shrimp and use boneless skinless chicken thigh meat cut into 1-inch pieces. Add chicken pieces along with the tomatoes.